The difficult thing about dropping an old habit is that habits are so habitual. 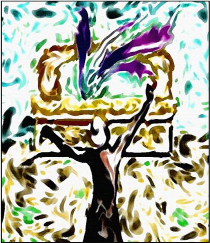 By now, most folks know the only way to be free of an old, bad habit is to create a new, good one to take its place. The good news is there is a proven way to start a new habit, and it is amazingly effective. It can be customized for most contexts – time management, project management, weight loss, household cleaning, managing time with kids or a spouse, and even personal growth and development. So if you want to erase an old habit and download a new one onto your brain’s hard drive, give these a try. Changing a habit is what you are doing. But why are you doing it? Chances are your answer can start with the words “So that…,” or something similar. It it is easy in carrying out of a behavior change to lose sight of why you are putting yourself through the discipline of starting a new habit. It’s not easy. It takes work. And without keeping your “So that” in the forefront of your mind, you can easily lose momentum. Since you don’t want to do that, do whatever you need to do so that your "So that..." (see what I did there?) sticks in your mind every day. research that indicates dreaming too much may actually derail you. Your dreams need to prompt actions, and those need to be small, intentional and calculated. With your eye on the prize, you need to ask, “What steps do I take, and in what direction, if the dream I have in my mind is where I want to end up?” Then take those steps every day. Be relentless! Your Dream can be a bit generalized, but your action steps cannot. 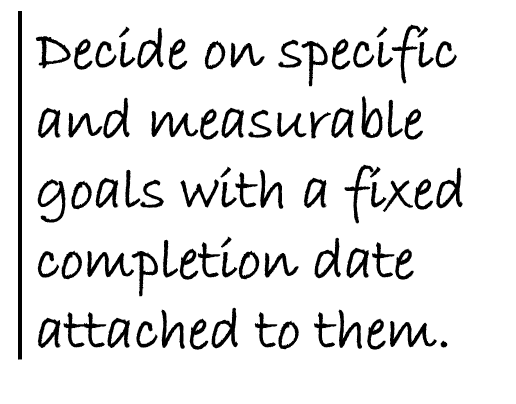 Decide on specific and measurable goals with a fixed completion date attached to them. Think of as many as you can that you believe would be most highly effective, and that most closely align with your talents and abilities. If your goal is to be in excellent physical condition, don’t select an action step of losing 30 pounds. You can select that as a step, but you have not given yourself anything specific to do. Instead, select a specific step of spending 35 uninterrupted minutes a day on the elliptical machine. Get and stay specific. Once you have selected some specific actions to take, chose the 1 or 2 that will make the most difference in moving you toward your goal. That difference can be determined by what you have the most time for, what is most interesting to you, or by what will produce the most obvious movement and results. But narrow the focus. Trying to change a habit by adopting more than 2 specific, new behaviors at a time is to set yourself up for failure. So narrow the focus to 1 or 2 action steps. They will happen. There is no doubt. Right here, I could run through all the clichés of picking yourself up after a fall, or say something like, "Sometimes you win, and sometimes you learn.” But you know all that. The one thing I want to add here is to suggest that you not only expect setbacks, but welcome them. This will help you get past the emotional hurdle of dealing with disappointment and feelings of failure much faster, or maybe avoid them entirely. Setbacks are inevitable, and the lessons we can learn from them invaluable, so don’t curse them when they come. And above all, don’t let them make you throw your hands up in surrender and abandon your effort to create a new habit. Setbacks are not here to undo you. They come to test and refine you. So welcome them as you would a long expected, old friend.